Tribal Leadership and Community Development Certificate graduates Allison Garner, Lorenzo Gage Gomez and Erika McPhetridge. When Allison Garner was a high school freshman in Bakersfield some four years ago, she learned about a college preparatory program for Native American students like her. 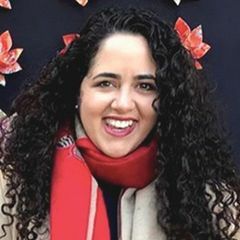 UCLA’s Tribal Leadership and Community Development Certificate, designed to increase access to college for Native American high school students by enrolling them in college-level courses focused on topics like federal Indian law and tribal economic development, sounded ideal for her. While her lack of easy computer access was a continual challenge for her in high school, she said that program administrators gave her rides to a career center that offered free internet service. “They gave me the resources I needed to do the work,” said Garner, who earned her certificate in 2016. 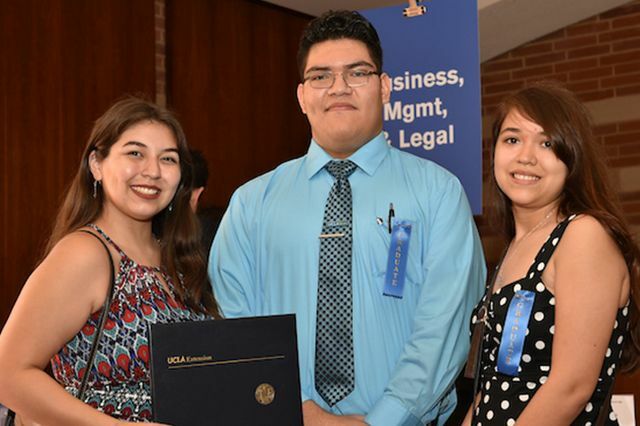 Launched in 2014, the program is a collaboration among UCLA Extension, the Tribal Learning Community and Educational Exchange at UCLA, UCLA School of Law and various tribal communities. It’s funded through an endowment grant from the San Manuel Band of Serrano Mission Indians, through which many students receive scholarships. Starting with 23 students in the pilot program, it now has more than 200 enrollees, and was earlier this year named the winner of the University Professional and Continuing Education Association’s 2018 Leadership in Diversity Award. 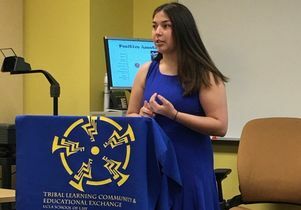 The program, which also includes courses on tribal sovereignty and cultural resource management, combines large- and small-group instruction, online and in-person classes, quarterly projects and college-readiness support throughout the program. “By taking college-level courses on issues germane to their communities, Native American youth can strengthen and demonstrate the academic, leadership, and personal qualities that help them apply for university admission,” said Aymara Zielina, UCLA Extension’s program director for the certificate. Dwight Lomayesva, director of the Tribal Learning Community and Educational Exchange at UCLA, said that developing some kind of college pipeline program for Native youth has long been a challenge. He noted that Native American enrollment is “not keeping pace with the overall nation” — only 0.8 percent of college students are Native. “We needed a year-round program to groom Native students for higher education,” he said. Native American students face many barriers to pursuing a college education, some technological, as in Garner’s case, others historical. “In many respects, our Native communities have a mistrust of academia through so many years of failed inclusion within the overall education process,” Lomayesva said. Using UCLA Extension’s expertise with online education to connect students with Native-focused, college-level courses helped create an effective program, which Lomayesva believes to be the only one of its kind in the country. “What we are accomplishing now is to bridge our Native communities with academia through a program that is culturally significant to our communities and trains our students to be more knowledgeable on contemporary Tribal issues,” he said. Justice Roshala, who grew up in San Diego County and is a member of the Choctaw nation, said he learned of the program through his mother, who is very active with their tribe back in Oklahoma. After a mutual friend connected him with Lomayesva, “I became the guinea pig,” for the new certificate program, Roshala said with a laugh. The program is open to students in grades 10–12. Students take one course per quarter, and can complete it on one year, though students can take quarters off, Zielina said. The courses are taught through a combination of online classes and weekly, in-person support from local tribal education “pods,” in which community leaders work with instructors to provide instructional support. Twice per quarter, all the students, course instructors, pod leaders, administrators and interested community members meet in person. During this time, students often present their course projects. Students also participate in an annual moot court competition that requires them to argue a critical issue of Tribal or federal Indian law. Quarterly meetings at college campuses introduce students to the opportunities, education, and support services of different universities. The program includes presentations from various college admissions officers, campus tours and bookstore or library tours, and often a student panel from the campus Native American Student association. 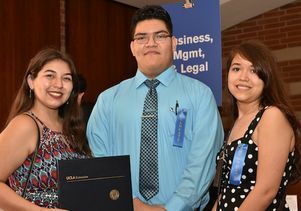 Roshala, now a UCLA junior majoring in political science and international relations, pointed both to his visits to UCLA and to the Native-focused curriculum as highlights, adding that both of his younger sisters are currently enrolled in the program. Lorenzo Gomez, a member of the Tubatubal Tribe who participated in the Bakersfield cohort and is a senior in high school, said he saw the program as a perfect opportunity to prepare for college. The social aspect is another important facet of the Tribal Leadership Certificate. The students include both students from U.S. public schools, and from reservation schools. “At my high school, there were three Natives in my whole class, and we didn’t know each other,” Garner said. “When you’re Native, there’s a sense of loneliness; you see other ethnic groups able to come together and comfort each other, but you feel sort of alone. 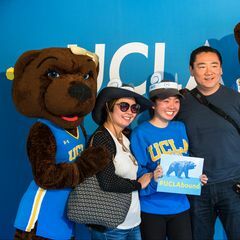 With the UCLA program, I felt like I was part of something. The curriculum and the connections forged through the program are helping it to become the college pipeline that its founders had hoped. The rate of college admissions for the leadership certificate program participants has more than doubled since it launched. Student participants have even been accepted to highly selective institutions like UCLA, Stanford and Brown. The number of tribes participating in the program has grown from two to 11. Participants in the program hail from California native tribes, as well as California residents like Roshala who are members of tribes based in other parts of the United States. Allison Garner, who earned a certificate in tribal leadership and community development from UCLA Extension.